The combination of a Scania K420IB chassis and Irizar 3700 Century body is the perfect match, be it for day tours, charter or even extended tours. A coach for all occasions: the Scania K420IB chassis coupled with Irizar 3700 Century is a sophisticated (and quiet) combination. Newcastle-based Sid Fogg's has taken delivery of its first Irizar-bodied Scania K420IB and has two more Scania K420EB's on order. These follow hot on the heels of its receipt of a Mercedes-Benz 0500RF with an Irizar body. Sid Fogg's has a fairly modern fleet and keeps them in immaculate condition. It has done plenty of work to keep them moving, including the contract to transport the Newcastle Knights rugby league team and its supporters. 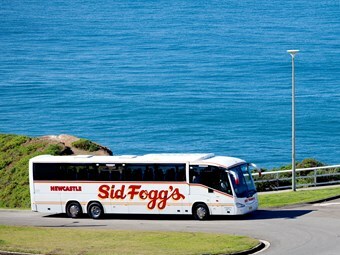 Since 1997 Sid Fogg's has been transporting the Newcastle Knights and at their first match at Sydney's Stadium Australia 100 coaches were required to move all the team and spectators. Other jobs handled by Sid Fogg's include concerts (Pink, AC/DC etc.) and Canberra snow trips. On arrival at Newcastle airport ABC was greeted by Scania's Tony Finneran and driven to the Sid Fogg's depot where we were greeted by Sid Fogg's boss Graham Habgood. After a chat and a look over the new toy we headed out for a run into Newcastle and surrounds. The coach had a reasonably high spec with 61 Styleride recliners covered in Reatex fabric and good leg room in a 14.5-metre body. Irizar's 3700 Century body has huge bins, a courier seat, toilet and a three-screen audio visual system. The driver's area is comfortable with everything in easy reach and easy sight. The driver sits on a comfortable air-suspended leather covered seat with the standard Scania dash layout and steering column. On the steering column there are two stalks; the left operates the indicators, high beam and wipers, while the right operates gear selection and the five-stage retarder. Cruise control buttons are on the steering wheel as are the controls for the in-dash information system. Chatting with Graham Habgood we found that this coach is delivering 3.9 to 4.1 kilometres per litre of fuel and averages one gear change to Sydney once on the highway. This is a sophisticated and quiet coach that is a pleasure to drive and also very manoeuverable, as I found out while driving to our photo stop (the steerable tag is an absolute gem). Some other features of the coach include electric blinds to the windscreen, fresh-water toilet and full climate-control air-conditioning. Powering the Sid Fogg's coach is a Scania 11.7-litre DT12 12 420 six-cylinder turbocharged and turbo compounding engine, developing 309kW (420hp) at 1,900rpm and pushing out a massive 2,100Nm (1550Lb-Ft) of torque between 1,100-1,350rpm. This is coupled to a Scania GRS895R 12-speed manual with Scania Opticruise and retarder. The Opticruise is a dream to drive and you only need to use the clutch when starting and stopping, making the driver's job so much easier and less stressful. Brakes are full air with discs all round and ABS, traction control and drag torque control. Another feature is the hill decent assist which allows the driver to hold a set speed on long downhill runs. Habgood told ABC that the reason he went for the Scania was the service he has received from day one. Scania's John Allen and Tony Finneran travelled with Habgood on the delivery run to explain all the features of the coach. "The after-sales service is excellent and the Scania's just keep on going," Habgood says. If the coach should break down the Scania service team are on the job fairly quickly. The Scania Irizar combination is the perfect match, be it for day tours, charter or even extended tours. ABC thanks Scania's Alexander Corne and Tony Finneran as well as Graham Habgood for allowing us a chance to see his operation and drive his latest coach. Find Scania buses for sale. Search for new Scania specs.